These images are high resolution, transparent versions of the MyTime logo. To download them, right click and click 'Save Image As...'. These logos can be provided in different formats (including EPS, vector and PDF versions). Simply email us and let us know what you need, and we will do our best to provide it. This logo should be included whenever you promote or talk about MyTime - on your organisation's website, flyers, posters, newsletters, documents and reports. The best place for this logo to appear is in the top left corner. Whether you use the tall or long version is up to you - simply use the one you think looks best in place. If you're not sure, feel free to contact us and we can help you decide. MyTime groups provide support for mothers, fathers, grandparents and anyone caring for a child with a disability or chronic medical condition. 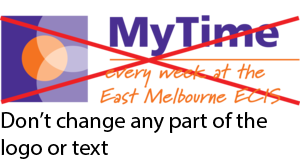 Any description of MyTime should include at least this description before any other information (such as group meeting times, quotes, or your organisation's role in MyTime). The amount of acknowledgement you should include when promoting MyTime depends on how the information is displayed. Below is a guide to what to include in any promotions. "MyTime is funded by the Australian Government Department of Social Services, and nationally coordinated by the Parenting Research Centre." In advertisements that require acknowledgement (see below for advertising sizes), this should appear at the bottom of the ad, in slightly smaller size than the rest of the text. In websites, this should appear at the end of the text. Websites can be difficult to control, and often you won't have a lot of control over how the information about MyTime will be listed. The sizes of print ads can vary greatly, from just 46 x 85mm to 380 x 551mm for a full page spread. Fairfax Media has created a visual guide to standard ad sizes, which can help you decide how much information to include.The table below uses this link to guide you on what to include in your advertisements. MyTime groups provide support for mothers, fathers, grandparents and anyone caring for a child with a disability or chronic medical condition. MyTime provides a place to socialise, to discuss, to get information, and to support and be supported by other carers. Make sure when you are adding MyTime information to any online listings, or promoting through an online newsletter, you include the MyTime website. You can highlight your group in the listing, but it's important to be clear that there are other MyTime groups across the state/country. Sometimes, the best promotional materials are the ones you make and use yourself. We are working on a collection of templates you can adapt to use as you like, based on some of the fantastic resources facilitators have shared with us over the years. In the mean time, we encourage any and all partners to make their own promotional materials. If you have made any materials, we would appreciate them being sent to us, to help us understand how groups talk about MyTime.